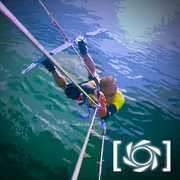 Puget Sound Kiteboarding Association - Pacific Northwest, Seattle, Tacoma, Bellingham and surrounding areas • View topic - Welcome to the new PSkite kiteboard racing sub-forum! This is a PSkite sub forum dedicated to racing news, gear, events and all things racing related! We hope kiteboard racing will take off in Seattle and the Puget Sound region like in has in San Francisco and Squamish, BC. Racing is a lot of fun, well structured and is now supported by several yacht clubs in the Puget Sound. It can be fun just cruising in a regatta, or challenging oneself against friends to see who catches the best gust or tactics. Seattle has many talented sailors and athletes and we think this will be a perfect sport for our many inland waterways. Race boards are also a great way of making use of light wind conditions when surfboards or TTs just won't do. Don't hesitate to post questions or info to this racing forum, or contact the PSKite race committee - I can be reached by PM for specific offline questions, feedback and general PSkite race committee involvement or organizational inquiries. Re: Welcome to the new PSkite kiteboard racing sub-forum! Advance wrote: It can be fun just cruising in a regatta, or challenging oneself against friends to see who catches the best gust or tactics. I'm going to have to get started on this. I was in Bucerias, MX (near Puerto Vallaerta) last week for the big Bucerias Classic event. "Racing" is much funner than I could've ever imagined. Of course, I was completely lost out there and maybe came in last place. Just fun to hoot and holler with 100 other kiters after the same goal. kip you should really try racing. In light of the latest Olympic shoot down for the kiters, we'll still march ahead and hold our own local races this summer. Stay tuned and welcome to the race forum.